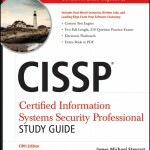 From the back cover: Comprehensive preparation for the 2011 CISSP certification exam. With pages of in-depth coverage, real-world scenarios, and detailed explanations of all domains from the Common Body of Knowledge (CBK) for the CISSP certification exam, this complete guide not only thoroughly prepares you for the exam, it also helps you develop practical skills for success on the job. Key topics include access control, business continuity, cryptography, biometrics, and more. You’ll also find helpful advice on how to pass each section of the exam.